This entry was posted in Articles, General Strategy, Hinterlands, Individual Card Analysis, Uncategorized. Bookmark the permalink. I have never thought of these ways of using develop! I often used it only to trash estates, coppers, and fortresses. I specifically like the idea of a consistent village/wild hunt strategy, and how opening with 2 terminals is actually safe with develop. Thanks, this article was well-written. 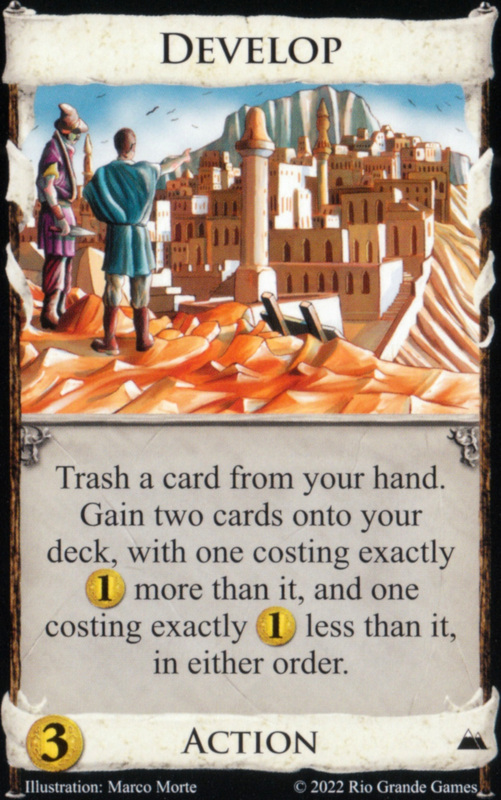 Another scenario where develop shines is with cards that give a benefit on trashing. Trashing a cultist for +3 cards, then top-decking a 4 and 6 is strong, and trashing a silk merchant is nice too. Also, some cards have a benefit on trashing. Trashing cultists for +3 cards and then topdecking a 4 and 6 is strong. Developing silk merchants is great too.